Time Team presenter and Blackadder actor Tony Robinson has been made an honorary doctor by the University of Exeter at a degree ceremony on Friday. He received the title of Honorary Doctor in Laws for his many years as an actor and writer, and his active involvement in politics. The degree ceremony will not be the last he sees of Exeter students. Those studying Experimental Archaeology will get the chance to work on experiments used on Time Team. 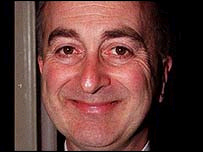 Tony Robinson, also well-known for his role as Blackadder's sidekick Baldrick, said Time Team had always been passionate about engaging as many people as possible with archaeology. He said: "It's entirely appropriate that the students of Exeter University should be given this opportunity to engage with us. Hopefully we might learn something from them." This scheme will further strengthen the university's links with the programme. Professor Mick Aston, who also presents the show, has also joined the Department of Archaeology as a visiting professor and will contribute to teaching on the Masters in Landscape Archaeology. The show's producer Tim Taylor will also be made an Honorary Professor. Dr Linda Hurcombe, Head of the Archaeology Department, said: "We are delighted to announce our collaboration with Time Team, which will make the department's experimental expertise available to the programme, while giving our students the opportunity to see how the concepts they are learning can be communicated to the wider public." Exeter's Department of Archaeology was recently rated third in the Times Good University Guide.